The first time I met a live blue crab was on the Hudson River, in the summer of 2005. I’d taken a group of immigrant students from the Borough of Manhattan Community College to the Hudson River Museum of Art in Yonkers. We were having lunch on the pier overlooking the river when we noticed a middle-aged couple in flip-flops lounging on lawnchairs, looking out at five or six different ropes that extended into the water. Every now and then, one of them would get up, pull each rope up individually, and check a wire-mesh box at the end of it. And every now and then, they would shake a crab out of one of the boxes into a white bucket. A group of my students surrounded the couple and began taking pictures. Both the man and the woman took the whole thing in stride, standing and posing. After serving as cameraman for most of the shoot, I asked the couple if they were planning on eating the crabs in their bucket. “Why not?” I asked, their outstretched cerulean claws tapping the inside of the bucket. I didn’t ask for details. When I decided to try my hand at crabbing, I was still unsure what specifically the man was sneering at. The thrill in the idea of crabbing to me was not just pulling the spider-like creatures from their watery homes, but eating them. The NYS Department of Health (DOH) recommends that women of child bearing age and children eat no crabs and that others eat no more than 6 crabs per week. In the DOH’s advisory on eating sportfish in the Hudson, they add, “Do not eat the green stuff in crabs.” This “green stuff,” also known as the hepatopancreas, is the innards. Encased in the cavity underneath the carapace, it’s also known to seasoned eaters as the “mustard.” Part of the culinary charm of the blue crab is that it is cooked and eaten in its entirety except for the shell (and sometimes, in the case of recently molted softshells, including the shell). An unfortunate, ironic consequence of this is that its organs—particularly the hepatopancreas, which filters and contains all the toxins the crab picks up from the sludgy bottom of the river—are cooked right along with the rest of the crab. I can’t imagine anyone eating it, but the DOH’s advisory, has nothing to do with palate. The hepatopancreas is the closest thing a crab has to a liver or a spleen, so any toxins it ingests are concentrated there. And anyone who knows anything about the Hudson knows that there are plenty of toxins to pick up. The plant, owned by Marathon Battery, did nothing unusual. The list of organic and inorganic pollutants released into the Hudson River estuary over this period reads like a short list from Rachel Carson’s Silent Spring and each affects different elements and species of the Hudson in different ways. Probably the earliest pollutant to the waters of the Hudson is Combined Sewer Overflow (CSO), a generic term for all the raw sewage that gets into the Hudson through various means. The number of sewage treatment facilities in the five boroughs, now at fourteen, has always been barely sufficient. This is never more obvious than after a hard rain or snow melt, when a person can walk to the edge of the city and see it bleeding sewage into the Hudson estuary through every crack and orifice. The main by-product of CSO is high concentrations of coliform bacteria, which were a primary reason for the downfall of New York City’s once-renowned oyster and clam fishery and still account for a large portion of the organic pollution in the Hudson estuary. The most ubiquitous chemical pollutants in the Hudson are Polychlorinated Biphenyls, or PCBs. In liquid form they served as insulators and coolants in large industrial equipment until 1979, when they were banned by the United States Congress, three years after the DEC banned commercial striped bass fishing in the lower Hudson. Once introduced, they persist in an environment for an unknown period of time (concentrations are not much less now than they were in 1979) and they compound and accumulate up the food chain, from zooplankton to blue crabs and on up to major sportfish. Though they are considered to be on the less-dangerous end of chemical water pollutants, which might at least begin to explain why a General Electric power plant dumped between 500,000 and 1,500,000 pounds of them into the Hudson between 1947 and 1977, PCBs are a known carcinogen, as well as being known to cause skin and liver conditions. And finally, if there is an industrial fire, PCBs convert to a dioxin compound that is exponentially more dangerous. Unlike most chemical industrial waste, dioxins have no known use, and are in fact not a catalyst but rather an unfortunate by-product of many industrial processes. Though never created intentionally, dioxins did find at least one use by the U.S. government: they were an active ingredient in Agent Orange. Like PCBs, they accumulate at the top of the food chain, and once there they compound in the fatty tissue of the organism. Particularly high concentrations may be found in breast milk, causing it to become toxic to offspring. This has caused the near-extinction of at least one species of eagle and numerous species of seals whose diets are composed mostly of large fish, and has produced the most concentrated effects among fishing communities, including the now-extinct Hudson River commercial fisheries. The most prevalent, though by no means the only, toxic metals in the Hudson are cadmium, lead, zinc, copper, nickel, chromium, and mercury. At least one metal on the list, zinc, is beneficial in limited amounts to the human body, but all are poisonous in larger quantities. All have been listed as overabundant in the Hudson since the early Seventies; besides lead, none of their levels have been reduced appreciably since. The collective term Poly-Aromatic Hydrocarbons, or PAHs, refers to most organic petroleum-related pollutant compounds, which may include mercury, lead, copper, arsenic, benzene, and toluene. You may notice an overlap here with toxic metals; this is because the term PAH classifies toxins not based on what they are, but what they do. All the toxins in this category compound more easily in oil than in water, so they won’t be found in any great amounts in water that’s not had exposure to some sort of petroleum emissions. That is to say, any water that’s had petroleum-fuel craft travel on it, or hosted industrial sites that create or use petroleum. Which is to say, any major body of water in the developed world. As with most toxins, PAH’s all affect the liver adversely, and like dioxins they are particularly dangerous to children and pregnant women—remember that advisory?—being directly linked not only to such physical effects as cancer, reduced birth weight of newborns, and heart malformation, but also, according to a 2012 Columbia University study, to child depression and behavioral issues. Though only trace amounts of DDT remain in the Hudson it is worth mentioning, if only as a ray of hope. The seed for Silent Spring was an article Carson wrote for the The New Yorker in 1961 criticizing the blanket use of DDT as a pesticide in the areas immediately adjoining New York City. Its effects are similar to many of the toxins listed here: it accumulates up the food chain, is stored primarily in fatty tissue, and is carcinogenic. DDT almost caused the extinction of the American bald eagle, whose primary diet is large fish. In 1972, in response to Carson’s clarion call, the U.S. Environmental Protection Agency banned agricultural use of DDT. Today, many bald eagle sightings abound in and around New York City, including one that sits atop the cross above the chapel at Manhattanville College, where I teach—a resurgence scientists and environmentalists have directly attributed to the DDT ban. Nickel hydroxide and its battery partner cadmium are to the crab population what DDT was to the bald eagle—if any the organism ingests enough, it becomes part of its essential makeup. The major difference is that the crab is not the top of the food chain; in many cases, we are. Since the toxic effects of exposure to cadmium were discovered in the Fifties, industrial precautions were put in place that heavily restricted worker exposure. Unfortunately, U.S. industrial regulations took another two decades to begin restricting outflow of cadmium waste to surrounding waters, including the Hudson. But since the crab is primarily a scavenger, living and eating in the muck at the bottom of the harbor, every other pollutant listed above also contaminates it. Whoever eats crab and shell will one day be king. Whoever eats crab and claws will find a purse of money every morning under his pillow. The crab with the golden eggs takes two sons of a tailor, and makes a rich man and a king of them. The crab’s primary diet is the worst part of the environment—half-dead organisms, decaying flesh on the ocean floor, even the ocean floor itself. Rowan Jacobsen notes, in his recent essay on the oil spill in the Gulf of Mexico, seeing a ghost crab dining on the tar balls, “carrying clawfuls back home.” Somehow, crabs convert the most hopeless detritus the world gives them into, if not bags of money and lordship over small fiefdoms, at least a delicious meal that we have the pleasure of pulling from the sea with our own hands. The question then becomes: what is the worst we can give them before the returns dwindle? John Proctor lives in Brooklyn with his wife and two daughters. His work has been published in Superstition Review, Defunct, New Madrid, Numero Cinq, McSweeney’s, Trouser Press, New York Cool, and the Gotham Gazette. 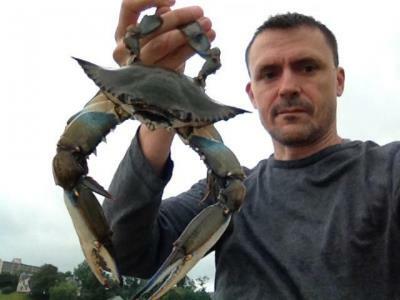 An avid crabber, he also teaches academic writing, media studies, and communication theory at Manhattanville College.